In this day and age, it’s almost inevitable that you will buy an electronic device for your child. It’s also been our experience that a portable media device can make long hours of travel much easier for the entire family. But what is the best option? For my first daughter, now 11 years old but age 8 at the time, I splurged and bought her an iPad mini after growing tired of loaning her my own. I happily welcomed back my iPad, now free of sticky finger prints and botched control settings, but I had misgivings about her now owning a device that could be easily broken and provided open access to its settings and the internet. In short, the iPad was parent intensive. Between loading appropriate content, monitoring screen time, and limiting what she could see and access, it required a lot of my time. Fast forward to my second daughter, now 7. For her, I purchased an Amazon’s Fire Kids Edition Tablet. Hands down, the Amazon Fire Tablet Kids Edition is so much more parent-friendly and equally kid-friendly without sacrificing anything. Here’s why I like it so much. After setting the age of your child, the Kids Fire Tablet will use Amazon FreeTime Unlimited to automatically compile age-appropriate content (in partnership with Common Sense Media) from a collection of over 15,000 books, movies, TV shows, educational apps, and games. It also includes educational content from PBS Kids, Nickelodeon, Disney, and more. I still review the content, because I find at times that I disagree with what they consider appropriate even with the age restriction. You can easily remove anything that has been added at any time. Select the age of your child and appropriate content will automatically be available to her. It’s a relief to be able to hand my daughter the tablet and not worry about inappropriate content or unlimited access to the internet or social media. Simply select which functionality you would like her to access. For example, I blocked access to the Web Browser and email but allowed access to Amazon video, Apps and Games, Books, and Photos. When you purchase a Fire Kids Tablet, it includes one year of Amazon FreeTime Unlimited at no additional cost. If you’d like to continue to receive the curated age-specific content, you have the option to continue FreeTime at a cost of $2.99 a month for one child or $6.99 a month for up to 4 children. I love this feature. I can choose what content my daughter will watch, and most importantly for me, how much time she spends on the screen. It is super easy to monitor and limit screen time on the Kids Fire. I configured its settings to provide 2 hours daily of unlimited screen time, but you can also specify how much time to allot to each activity. For instance, unlimited book time but limited game and video time. You can set total screen time or time by activity. You can also dictate when the content is available on the tablet. I’ve specified that my daughter can use it from 7am-7pm. That way, when my daughter is (or should be) asleep she does not have access and won’t even be tempted by it. You can also specify different hours of availability for weekdays and weekends. The Amazon Fire Table Kids Edition comes with a nice durable case available in 3 colors (blue, pink, and yellow). It also comes with a 2 year warranty, no questions asked. How you can beat that? If it’s broken, it will be replaced for free during this time. If a kid decides to see if the Kindle is waterproof by dropping it in a toilet, Amazon will replace it. It is basically a parent's dream warranty. My daughter’s Fire Tablet has indeed gone the distance after several drops (those are just the ones I’ve seen). The case has done its job, and we have yet to have any problems even with some rough handling. After almost 2 years, our battery wasn’t holding a proper charge, so we shipped it to Amazon (at no charge) and they returned it in fine working order. Literally priceless. Speaking of price… It’s regularly priced at $99 and often less with an Amazon price deal (today it was $69.99 for Amazon Prime members), much less than the Apple Ipad-Mini currently on sale for $299. The low price combined with the no questions asked 2 year warranty seems like a no-brainer here. I considered buying a regular (adult) Amazon Fire Tablet for my daughter because it is less expensive than the Kids Edition, but there were just too many benefits in the Kids Edition that I couldn’t pass up. I have no regrets in that department. You can find most of the big name apps for the Kids Fire including Minecraft which would have been a deal breaker. The Kids Fire Tablet has a Child Mode and a Parent Mode. In the Parent Mode, you enter your password to manage your child’s account, change settings, download videos from Amazon Prime, download additional games like Minecraft, etc. In this mode, it functions just like the Fire Tablet with access to adult apps like Facebook, Netflix, books, movies, etc. 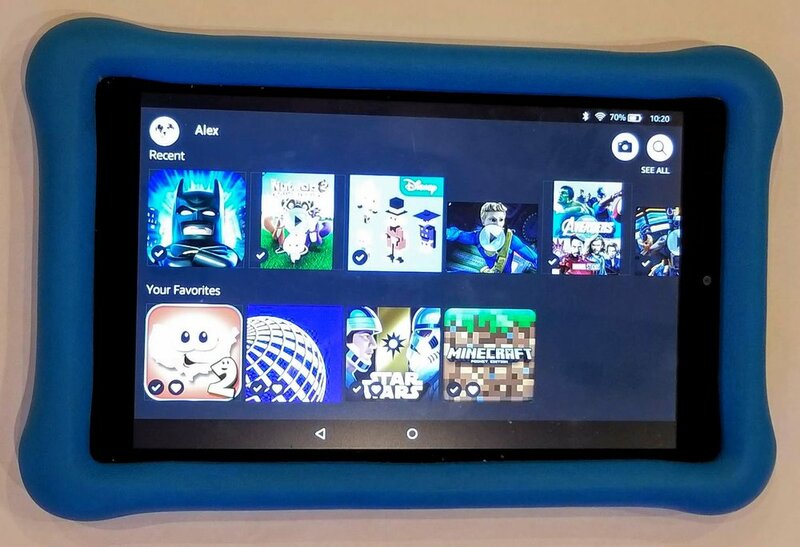 The Kids Fire Tablet runs primarily with Wi-Fi, but you have the ability to download videos, apps, books, etc. for those times when you don’t have access. Before a trip, we simply download a favorite TV series or fun movies. Simply tap and hold the episode/movie you would like and select download. When an Internet connection is unavailable, your child will automatically see available content that has been downloaded to their profile. The battery life is good and typically lasts 6-8 hours for us. Download videos for when you don't have access to Wi-Fi. You can download a fair amount of material, but I periodically have to delete previous downloads to make room for more. It has 16 GB internal storage, and you can even add a microSD card for up to 256 GB of expandable storage. That's a lot of movies, folks. The option of additional storage is a huge benefit of the Fire Tablet, and you will want to take advantage of downloading an unlimited number of Amazon Prime Original Movies and TV shows as well as their other Prime TV/Movie options (both free and for purchase). Any movie you already own on Amazon Video is available for download. Otherwise, you can borrow up to 19 movies and/or TV shows for as long as you want. You just have to connect back to WiFi once every 48 hours and they will automatically re-borrow. Note: We purchased the SanDisk Ultra 32GB microcard from Amazon for $9.99 and it has provided more than enough extra storage. What child doesn’t love to take photos? On Kids Fire, they can take pictures or videos and even edit them by adding stickers, drawings, etc. It's another good source of entertainment and creativity while on vacation. The camera however, is the only category where the iPad beats the Kindle Fire as it has a much better camera. But the Kindle’s camera is adequate for most kid pictures. So, for our family, the Kids Fire Tablet is the easy winner over the Apple i-Pad. 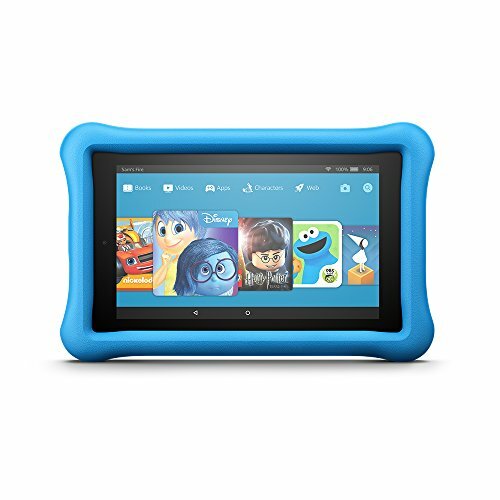 With its ease of adding appropriate content, ability to set limits on screen time, fantastic price-point, durability, storage capacity, and 2-year warranty, Amazon Kids Fire Tablet will be a great gift for your child and for you! Want to take a family vacation to Europe but can’t find affordable flights? Try flying into London, spending the night, and then taking the Eurostar out in the morning. You can sometimes score cheap flights, and even better, you can sometimes skip an overnight on a plane. From St. Pancras Station in London, take the Eurostar direclyt to France, Belgium, or the Netherlands. It’s a great alternative to flying direct to Europe and pretty easy to do. If you live in a locale that doesn’t experience true winter weather, meaning bitterly cold temps, wind, and big powder like you see at ski resorts in the western United States, this packing list is for you. Having planned our annual ski trip to Big Sky Resort, Montana for eight years now, we’ve managed to create a packing list that ensures everyone will be warm and comfortable while enjoying the snowy winter wonderland. If you are like many of us, you spend more time than you would like nagging your kids to go outside more and text their friends less. I am not sure exactly when I became my parents but it definitely happened. Sometimes a cool new toy can be just the thing to get them excited about the great outdoors, whether on a camping trip or just fun in your backyard. Here are some of our best ideas, just in time for the holidays. Have you ever had a piece of travel gear that turned out to be the best investment ever? We bought an Osprey Jet 3 years ago for a 6 year old that is such a thing. It has been to over 12 states, 13 countries, hiked in 6 national parks, and flown over 100,000 miles. Traveling with kids always involves carrying more stuff than you think. I was ecstatic when the kids moved out of car seats and diapers as it cut the amount of luggage I was hauling around significantly. But they still needed a booster seat. Enter the Bubblebum booster seat. Invented by a Mom in Ireland who also disliked lugging large, plastic booster seats on trips, the magic of these seats are that they are inflatable. If you are new to the world of Airbnb, let me just say it will open your mind to what can happen with travel accommodations. No more tiny hotel rooms, tip- toeing around as soon as the kids go to bed. Cook full breakfasts in your own kitchen and do laundry mid-trip. So grab a glass of wine, a comfy spot on the couch, and follow these steps below to find your amazing Airbnb. Americans leave over 659 million paid vacation days on the table each year. Does this sound like you? January 30 marks the big day when Americans are reminded and encouraged to schedule their vacations for the year and take advantage of their accrued vacation days. Simply Awesome Trips takes the guesswork and logistical planning off your plate and most importantly saves you hours of time planning a vacation.